Ozone sanitation provides highly effective reduction of spoilage and pathogenic microorganisms. The results are safer produce, with better quality, for your operation. Ozone sanitation for produce is environmentally friendly, completely sustainable and 100% organic certified. 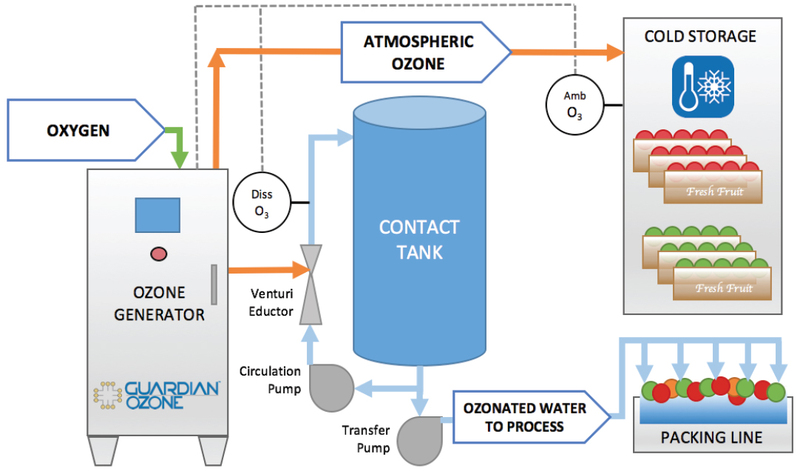 Recent technology improvements have allowed for the successful application of ozone use for both aqueous and gaseous in post harvest treatment. Many growers and packers have found that storing tree fruit in an atmosphere with a low concentration of gaseous ozone can significantly improve produce quality and sanitation. Ozonating water for tree fruit packing lines has proven to be the most effective intervention as an antimicrobial agent. Guardian Systems utilize a proprietary patented aqueous process for sanitizing tree fruit packing lines that allows for the highest level of antimicrobial intervention available. Our system eliminates off-gassing and ensures no negative impacts to the fruit or fruit quality. Because of its significantly higher oxidizing power, ozone can be applied at significantly lower doses than either chlorine or PAA. Ozone also reverts to oxygen after reaction, leaving no chemical residues that can impact product taste or appearance. Since it is generated as-needed, ozone systems eliminate the need for costly chemical storage, handling and use, and provide safer working conditions. Finally, customers report lower operating and lifecycle costs, and better ROI with ozone systems versus chemical-based sanitation. By using the Guardian Systems for room sanitation prior to long term storage packers are starting out with the cleanest environment possible. The gaseous ozone atmosphere provides excellent control of mold sporulation and nesting among bin fruit, and helps suppress ethylene production. Properly maintained and operated, ozone cold storage systems control spoilage and potentially can increase pack-out and yield. Utilizing ozone in sanitation and cold storage is a key step to meeting the requirements for the FSMA.